As part of our 40 acts of kindness that we are taking in part in during Lent, we have registered Newtown C of E Primary School with the ‘Share the Miracle’ project. The idea behind this project is to ‘put a dent in loneliness’ and strengthen our community. 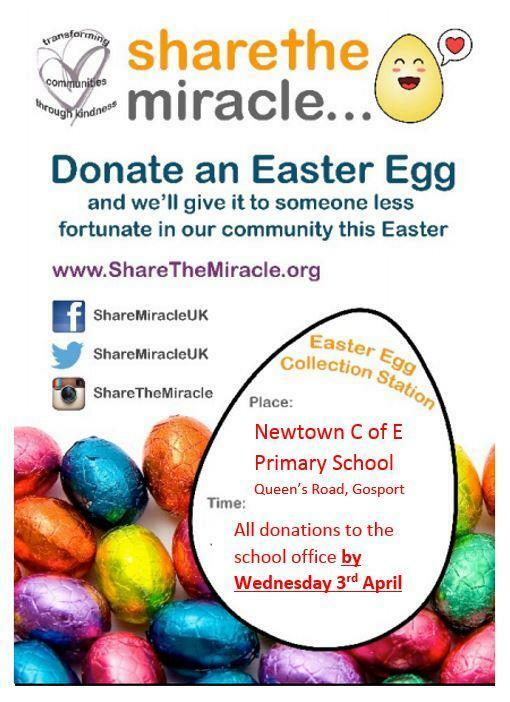 We would like to invite everyone in our school community to get involved by donating an Easter egg of Easter gift. As part of their homework, the children have been invited to make an Easter card or picture. We will attach a card to each gift and they will all be delivered to local care homes or organisations supporting the more vulnerable or lonely people within our community. If you would like to attach your child’s card directly to your donation, please feel free to do so. We have set up a ‘Share the Miracle’ station in the school office where we will collect and display all of the donations and cards. On Friday 5th April, all the gifts and cards will be delivered within the community. The children’s homework and any Easter egg or gift donations can be delivered to school via the class teachers or directly to the office anytime from now until Wednesday 3rd April. Thank you in advance for your support. Please share this post to ensure as many people in our community are aware! We look forward to collecting the cards and donations and sharing the miracle!